Click on underlined links to see sample pages of our products! To pay an invoice with your credit card, scroll down. Need our current order form? Click Here. 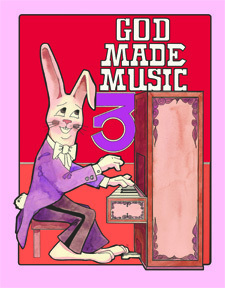 The God Made Music series is published for 9 different levels...4 year old preschool, 5 year old kindergarten, grades 1 through 6, and a composer/listening study for use in grades 7 and above. Each workbook contains approximately 34 lessons. One minimum thirty-minute lesson per week throughout the school year is recommended. A teacher's manual is required to teach each level, and the corresponding cd's bring the program to life musically. One set of Musicards (or Mini-Musicards for homeschools) is also required. Students may begin in any level of God Made Music without completing previous levels. The course is easily taught using the "self-teaching" manuals. For schools, we offer half-price and free teacher's manuals and cd's: Order 10 of any one level of God Made Music and we will give you the teacher's manual and cd's for that grade at HALF PRICE. 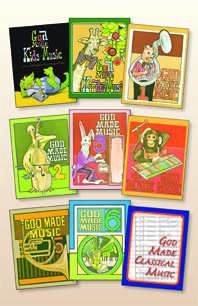 Order 15 of any one level of God Made Music and we will give you the teacher's manuals and cd's for that grade FREE. Feel free to contact us if you have a small school and we will customize a plan specifically for your school. If you are a home schooling parent, please check out our packet prices. Click here to see all GOD MADE MUSIC products. Want to learn more about God Made Music? Click here to read the booklet "Don't Forget To Teach Music." 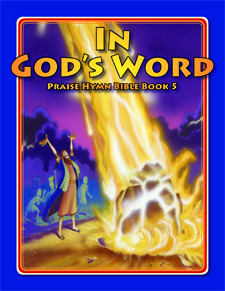 The PRAISE HYMN BIBLE SERIES is a Bible study series for elementary grades 1 through 6. Each book contains 100 lessons. At the end of each three-year program, students will have completed a through-the-Bible survey of both the Old and New Testaments. 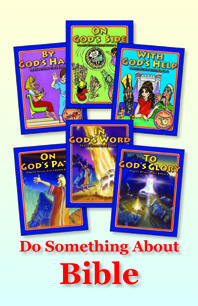 This series was written for children who have grown up in church or a Christian home and have heard Bible stories often. The authors have tried to make every lesson contain something new to help maintain student interest. Sample student's and teacher's manual pages are viewable by clicking on the image and reviewing the various grade levels. Click here to see the PRAISE HYMN BIBLE SERIES. Want to learn more about the Praise Hymn Bible Series? Click here to read the booklet "Do Something About Bible." The Hymnplayer series has been revised into 4 books (Beginning Hymnplayer, Primary Hymnplayer, Intermediate Hymnplayer, and Advanced Hymnplayer). The new edition books are now available. Click on the link below to see the new Hymnplayers. The HYMNPLAYER series is a 4-volume course that uses traditional hymns to demonstrate how to add chords and runs, modulate, transpose, arrange, and accompany for congregational singing. 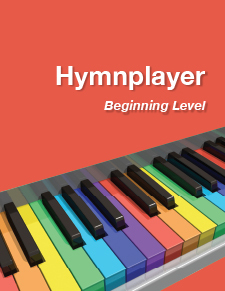 Children may begin with the Beginning Hymnplayer immediately after they begin taking lessons or the Primary Hymnplayer if they have been playing for a while. Older students and adults who play 4-part from the hymnal and want to "sharpen" their hymnplaying skills, learn new techniques, or play unique hymn arrangements may begin in the Intermediate Hymnplayer or Advanced Hymnplayer. The Primary, Intermediate, and Advanced Hymnplayer books also include many free online examples and arrangements. Click here to see the HYMNPLAYER series. ...is a great way to teach your choir how to read music. It takes only 10 minutes per rehearsal for a total of 25 lessons. Lessons include vocal technique, history of church music style, a short history of musical notes, music concepts and terminology needed for reading music, musical examples, a study of instruments used in the church, flash cards, and some "corny" choir humor. 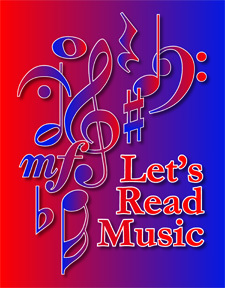 Click here to see LET'S READ MUSIC. You may pay an invoice online using your VISA, MASTERCARD, DISCOVER, or AMERICAN EXPRESS card. 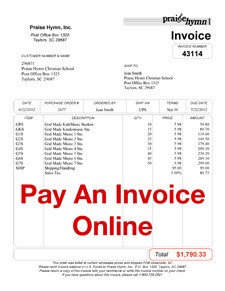 Click the link and enter the DOLLARS and CENTS equal to your invoice amount. In the check-out COMMENTS section please indicate your customer number (above your name on the invoice) and the invoice number you are paying. Click here to pay an invoice.